[Pakistan: 13th July 2013]: Academy Award winning Pakistani film “Saving Face” has been nominated for five Emmy Awards including, Best Documentary, Outstanding Arts and Culture Programming, Outstanding Research, Outstanding Cinematography: Documentary and Long Form and Outstanding Editing: Documentary and Long Form at the prestigious 34th Annual News & Documentary Emmy Awards organized by The National Academy Of Television Arts & Sciences. The 34th annual News & Documentary Emmy Awards will be presented on Tuesday, 1st October at an elegant ceremony at Frederick P. Rose Hall, Home of Jazz at Lincoln Center, located in the Time Warner Center in New York City. The event will be attended by more than 1,000 television and news media industry executives, news and documentary producers and journalists. 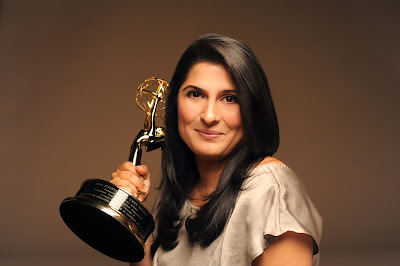 Sharmeen Obaid-Chinoy will be attending the prestigious awards distribution ceremony in October, previously missing the opportunity to attend the event when her film “Pakistan’s Taliban Generation” won in 2010 due to the sudden demise of her father, to whom she will dedicate the Emmy should Saving Face win this year. The nominations are also indicative of the quality of talent being produced by the local Film and Arts industry as another Pakistani, cameraman Asad Faruqi, cinematographer and director of production at SOC FIlms, joins Sharmeen Obaid-Chinoy in securing an Emmy Award nomination excellence in cinematography in the category Outstanding Cinematography: Documentary and Long Form. Saving Face has achieved significant acclaim in the international film and arts community and has garnered many illustrious awards including the eminent Academy Award (Oscar), IDA Documentary Award, Juliane-Bartel Award, Germany, Abu Dhabi Film Festival Audience Choice Award, New York Indian Film Festival “Best Documentary Film” and the SAARC Film Award for “Best Documentary”. Saving Face chronicles the work of acclaimed British Pakistani plastic surgeon, Dr Mohammad Jawad as he travelled to Pakistan and performed reconstructive surgery on survivors of acid violence. Acid violence, an extreme form of physical abuse, is systemically underreported in Pakistan; official figures state that 150 cases of acid violence are filed every year, though it is estimated that the actual figure is far greater. Saving Face is an account of such violence told by survivors through their personal journeys of endurance, recovery and reconciliation. The observational documentary was filmed entirely in Pakistan, primarily in the Seraiki belt in addition to Rawalpindi, Karachi and Islamabad.